The bucket dolly with work with any shape of 5 gallon bucket, and will lock in tight with screws. The high quality castor wheels mean that it will withstand a hefty load without reducing your wheels’ ability to spin. I’ve thought up just small fraction of the creations you an make with a bucket dolly. This list is just to get your mental gears turning so you can come up with your own wheeled bucket innovations. Car washing or mopping remains the most common use for a bucket dolly. A 5 gallon bucket full of water weighs 40 pounds, and it’s great to be able to move all that mass around with the kick of a foot. 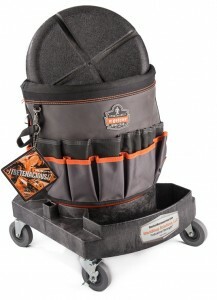 You can combine the bucket dolly with the 5 gallon bucket tool apron and create a mobile toolbox to pull around the work site like the one pictured from Amazon. Attach a strap and you can lead your mobile tool bucket around like a dog. In a previous post, I’ve suggested that you could combine the bucket dolly with some bucket seating for a five gallon office chair. One of the best pieces of furniture we’ve ever acquired for our kitchen is a wheeled kitchen cart. You could use a bucket dolly combined with 2 buckets stacked on top of each other and a bucket cutting board to make your own five gallon kitchen cart. Or you could make a mobile camera stand with a bucket dolly and a 5 gallon bucket tripod. Thought of something cooler? You can share in the comments. Adding wheels to anything increases the danger tenfold. For example, don’t use a bucket as a step stool if it’s on a dolly! You’ll also want to avoid stacking beyond 2 buckets high on a dolly. A wheeled bucket will also have a tendency to roll down a gradual slope. 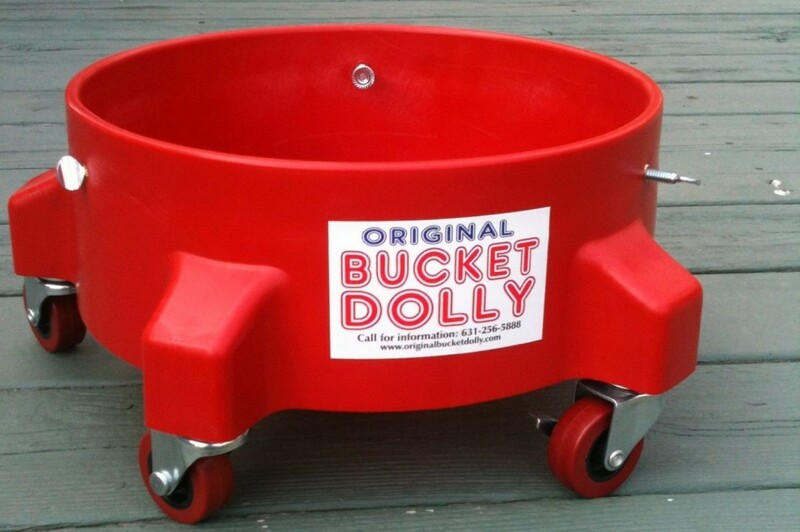 Bucket dollies will often be sold in paint or hardware stores. If you’d rather have it delivered to you, the best place to get the bucket dolly for cheap is off Amazon.com. Since it’s such a popular bucket accessory, enhanced versions are being manufactured such as the double dolly and single dollies from Workshop Solutions. These models have special designs to hold beverages and drain excess water. 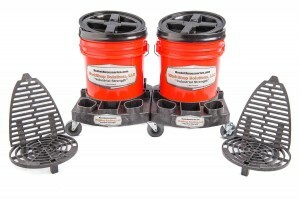 Will the 5 gallon bucket dolly work with 5 gallon beverage coolers. The coolers that sports teams use for the players? probably not, since those 5 gallon beverage container have an extra, larger, bucket around them so that they are insulated. I was inquiring about your bucket dolly, and was wondering if you could give me a quote?